Filmmaker Danny Boyle is inviting people to gather on beaches across the UK for an informal, nationwide gesture of remembrance on 11 November for the men and women who left their home shores during the First World War. Millions of people served in the First World War and the vast majority left by sea. On Sunday 11 November, people are invited to assemble at one of 32 beaches at low-tide to take part in a series of community-led events. 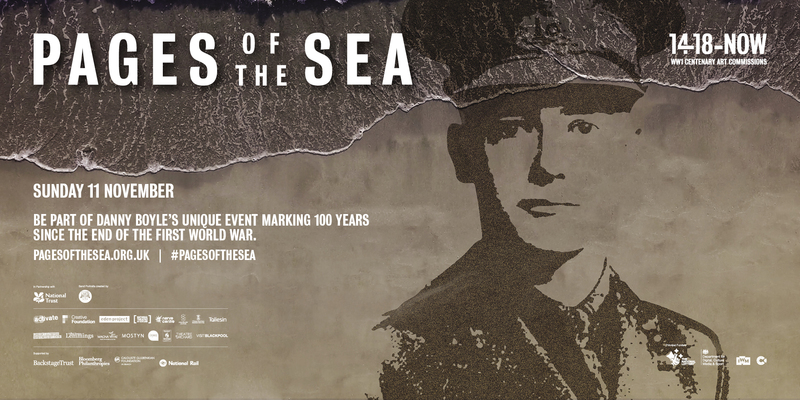 A large-scale portrait of a casualty from the First World War, designed by sand artists Sand In Your Eye, will be drawn into the sand in many locations and washed away as the tide comes in. In addition, the public will be asked to join in by creating silhouettes of people in the sand, remembering the millions of lives lost or changed forever by the conflict. Additional activities are being organised by each participating community, creating a personal, local experience on each beach. Poet Carol Ann Duffy has been invited by Boyle to write a new poem The Wound in Time, which will be read by individuals, families and communities as they gather on the beaches. Copies of the poem are available at the beaches around the UK and online for those who wish to come together or to offer their own personal contribution. Visit the #PagesOfTheSea website for more.